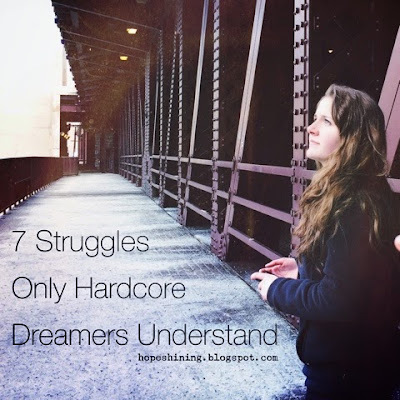 This one goes out to you, dreamers, because the struggles can be so very real. 1. You wonder how the whole world just can’t be as ridiculously excited as you are. Yeah, people think you’re crazy. Let’s just be real here, though. Sometimes you think they’re really the crazy ones because, um, life is big, exciting, and so full of dreams. These dreams need to be tacked with everything we’ve got. How can everyone not be so excited about this? 2. You’ve mastered enduring that look people give you when they just don’t catch your vision. Yep, the dreams have dealt with disinterest. Others give it alll the timeee. Some people may never catch your vision and get your vibe. Dreamers have learned to deal with this reality and keep rollin’ anyway. 3. Your life if full of those late nights and early mornings, and you embrace it. The work has to be done, and you know the importance of just buckling down and doing it. That may mean some late nights (or more like early mornings) of pain, sweat, and tears, but dreamers have learned that this is necessary (and even good). They know that schedules can be full, but they know that life can be empty if their dreams lay dormant. And dreamers aren’t afraid to put in the hard-work to make sure this isn’t the case. 4. You’ve looked doubt in the face (more than once). It has been said that people who are capable of soaring to the highest heights are also capable of sinking to the deepest lows. Yeah, the dreamers get that and have been there. Big time. Many times. The dreams can seem (more than) a million miles away, and the path to get there can seem like (more than) a million times more difficult than wished. Dreamers know this doubt will come and have learned to just expect the hard days. 5. You get that inspiration comes in unusual ways. You could be walking down a store aisle, hear a new jam, get your groove on, and suddenly realize how this all relates to your master-plan. Nothing is lost on you. Dreamers know that basically anything can lead to another flash of inspiration, and they live always ready for it. They’re the “bring it” kind of people. 6. You’ve felt the fear and told it who’s boss. Fear can paralyze some people, but it mobilizes the dreamers. Yeah, the dreamers have been hit with fear (and maybe more than the non-dreamers, too) because they know what it’s like to take risks and face failure. It doesn’t shut them down, though; it wakes them up. Dreamers have learned to let fear remind them of how high the stakes are and remind them that they have the power to overcome those stakes. Dreamers know that this overcoming is a glorious reality. 7. You have an uncanny ability to just turn it all around. You’ve been up. You’ve been down. You’ve succeeded. You’ve failed. You’ve believed. You’ve doubted. Dreamers know that life isn’t always going to make sense. Confusion, pain, discouragement, obstacles and so much more could always be around the corner. Clarity, happiness, hope, triumph and so much more could always be around the corner, too. Days of both will come, and dreamers realize that both of these are necessary; both are good. Dreamers know that both make them stronger and refuse to let life break them down. So, here’s to you dreamers; you’re incredible. One of my faaaaavorites by you <3 Well done, girl.